Home Theater designs can be used to design in your interior for placing a large screen television on the wall with speakers and a video projector is attached to the roof. It usually consists of couches, chairs, Coffee table, wall sconces, lamps and the wall is decorated with soundproof panelling so that it does not create any disturbance to others. Contemporary style of architecture deals with modern style and represents day to day trends. The style is decorated with monochromatic colors which gives an elegant look and has carpets laid on the flooring which gives comfort to the foot while walking. In the view of the image you can see a simple and amazing contemporary style home theater interior. The false ceiling is dry wall ceiling with plain light fixtures and the flooring is made of laminated hard wood. The walls of the interior is decorated with nature theme photo frames and white blinds. The interior has beige monochromatic color and has cabinets for storing accessories. The LED television is mounted on the wall and has speakers. The room has couches with crimson red in contrast with black color which are comfy for seating and has wooden cabinets with chest of drawers. This view of the image shows you a beautiful contemporary style of home theater which is decorated with entirely stark white color. The false ceiling is dry wall ceiling with plain light fixtures and the flooring is made of plain vinyl flooring. The room has a big screen television mounted on the wall and has speakers with closets for storing accessories. The flooring has a black saxony carpet which is sprucing the room and has a glass coffee table with curved legs and is used for serving. The room has couches made of leather. This is an ideal image of contemporary home theater room decorated with the acoustic panels so that the sound does not go out of the room. The interior is decorated with 3 D squared acoustic panels and the false ceiling is made of ply wood with recessed lights. The flooring is made with a smooth carpet and has an exclusive art. The carpets are chosen carefully as they should absorb sound in the room. The room has wooden panelling with wall sconces and has leather couches for seating. There are panelings which are plastered to the surface of the walls to prevent the distortions in the room while listening. The room is baronial and its appearance tells you that it is a interior of modern contemporary style home theater. The flooring is made of smooth textured carpet which prevents reverberation and has leather arm chairs for seating. The room has a counter top made of timber and the false ceiling is plaster of paris ceiling with recessed lights and hanging lights. The interior is decorated with wooden cladding and has a large screen attached to the wall. There is a video projector attached to the roof so that it projects image on the screen. The false ceiling is dry wall ceiling with recessed lights and the interior is decorated with flashy colors. The room gives a cozy feeling and the flooring is made of laminated white wood. The interior is designed with out any extravagant materials and this type of design can be preferred for small space areas. The room has wooden cladding with a stunning look and has an Led mounted to the wall. The wall cladding has inbuilt speakers, and some are laid on floor. The room has chaise lounge with upholstered headboard, cushions for seating which are very comfortable. In the view of the image you can see a monochromatic color which gives a cozy feeling and the flooring is made of plain vinyl flooring. The room has a glass window and can view outdoor and can be covered with draperies. The room has a wooden table with iron legs and the room is simple. The interior is decorated with wooden closets and it stores accessories, books display items. The screen is attached to the wall and has closets which are under the television. The room has speakers on the floor and has a brown leather couch for seating. 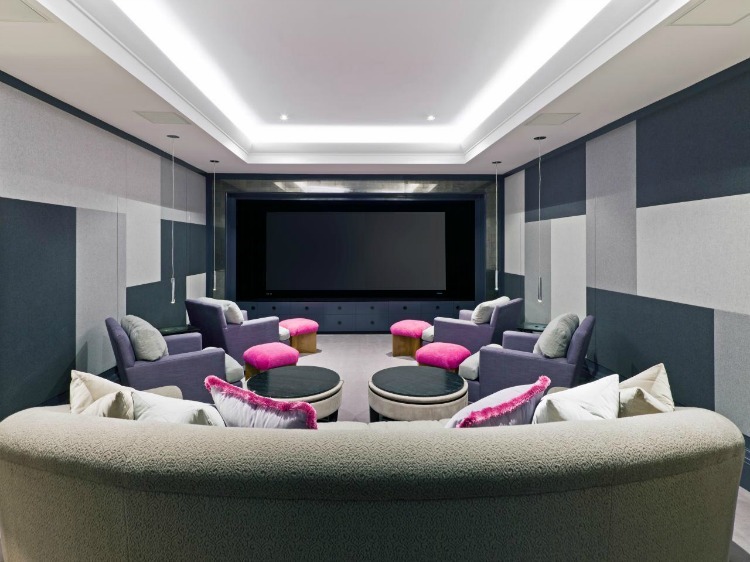 This image has a large space contemporary style home theatre and gives a modern look. The false ceiling is made up of plaster of paris with hidden lights and recessed lights which illuminates the room. The flooring is made of plain vinyl flooring and has acoustic proof wall cladding. There are hanging lights attached to the roof. The room has plenty of seatings such as chairs, settees, couches with cushions and the wooden stools are eye catching in the room with its color. It has tables for serving drinks or edibles and a big LED screen is attached to the wall for entertainment. This image views you a home theatre room and it even acts as a living room. The room has drop out ceiling suspended under structured ceiling and has recessed lights. The room has plain vinyl flooring and has a striped plush carpet which matches the color of the floor. The interior is decorated with floor lamp, sara paloma pottery with wooden sticks, abstract painting and a photo frame. The room has mid century couches with cushions and has a knitted pouf. The room has cabinets with drawers and has a television placed in it. There is a glass table for serving and you can place speakers also in the room. 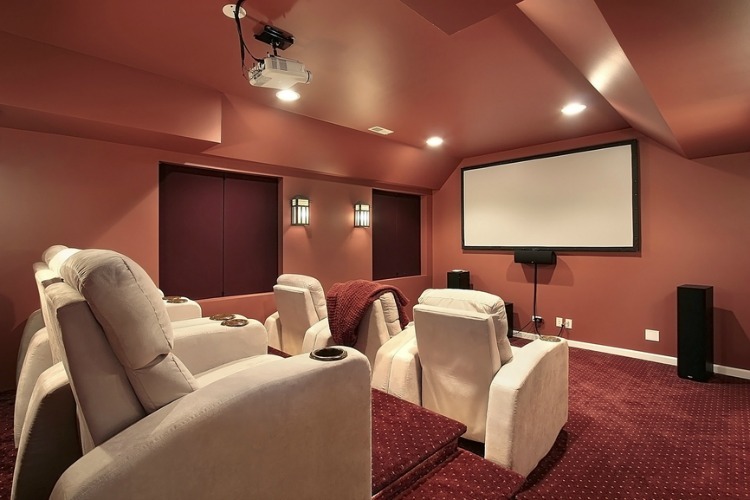 In the view of the image you can see a contemporary style home theater room and the interior is decorated with wavy maroon color which is neutral. The flooring is made of sound proof carpet which absorbs sound and prevents echo. The carpet gives a royal look on which speakers are placed and the false ceiling is drop out ceiling with plain light fixtures. The LED screen is mounted on the wall and there is a video projector to project the image on the screen and has wall sconces attached to the wall. The room has reclining beige chairs for seating. In the view of the image you can see an extra ordinary contemporary style home theater room. The false ceiling is stunning with a painting of theme of sky with recessed lights and has an outlet covered with glasses above the roof. The flooring is covered with sound proof textured carpet. The room does not have any knick materials, but if you like to decorate you can place different display items, paintings. There is a screen attached to the wall and has a projector attached to the roof that enables the image on the screen. There are couches for seating and has cabinets for storing accessories.